I had planned on going to work today and I was going to scan an inspiration picture from a magazine for my usual Inspiration Friday posts. Unfortunately, I don't have a scanner at home. After the fiasco with my taking my dog to work yesterday, I am home today, forced to take a vacation day. I should have know that taking my dog to work would not be a good idea. He is so attached to me that I should have known he would not be content sitting in a crate next to me, he must be in my lap (which is where he is now). I had to go to the restroom so I put him in the crate. I figured it would be a good time because everyone who sits around me was off in meetings so if he whined (which I knew he would) he wouldn't bother anyone. I came back from the restroom and his crate was open and he was gone! I was running around my building screaming his name, sort of like a frantic mother that has lost her child in the mall. My main concern is that he bites when he's scared, well he's a chihuahua so he's scared a lot so he bites a lot! As I was running through the office I remembered that when I was walking to the restroom there was a large group exiting the back door to go to lunch. I ran outside and sure enough, I saw everyone wandering around trying to find the dog that came out of nowhere and ran out the door. I called his name and he came running to me with his tail between his legs, scared to death. One of the girls yelled out "you may want to call Security and tell them it was your dog, we just called them and said there was a stray dog in the building." Okay, I knew this wasn't good so I grabbed Beau and we went to lunch. I took him to PetSmart to get some treats to keep him occupied in the afternoon. About 2:00 pm I got a call from Security asking me if I had a dog in the building. When I said yes they told me in wasn't allowed. Oh well, I'm home today and they are grouting the bathroom floor and they should be done by today or tomorrow but if not I found a doggy daycare that will take him on Monday. So, that's why I don't have any inspiration pictures from one of my old magazines today. Hopefully the mosaic of these lovely cottages will suffice. Wow! What a day! Like Kim said, I wouldn't have even been able to get around to blogging! 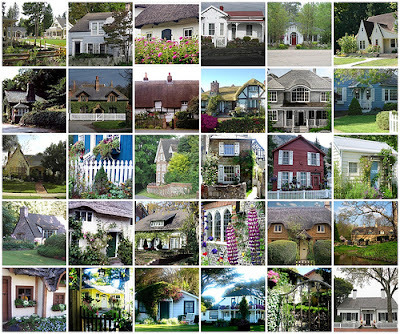 So thank you for the the lovely collage of pretty cottages! Gah! I'm so sorry to hear you such such a situation on your hands. Poor puppy. Having said that, I love what you did post, and have to echo kim's "b" sentiment - if I had that in my world, I think my blog would've stayed in an un-updated state.